The Toyota Tacoma is a beefier version of a long line of Toyota pickups produced in a moderately successful attempt to crack the American market. While the most popular American vehicles are the GM and Ford pickups, Toyota's top seller remains the Camry - the best selling car in America - and it remains far below Dodge in pickup sales, a good long distance from the Big Two. That situation is bound to change - the question is how long it will take. The Tacoma is one more step towards the goal, and, like the Dakota and now the Colorado, it distinguishes itself partly by moving up from compact to mid-sized, with an optional large cab, powerful V6, and also by having very quick acceleration. 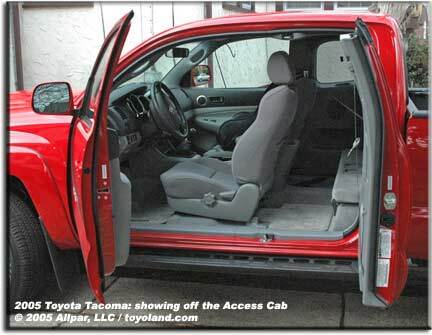 Our test vehicle was a Tacoma Access Cab, the middle of the range, with hidden "suicide doors" and flip-and-fold rear seats. Ours had the Toyota Racing Development (TRD) sport package #2, a hefty $4,565 option, with a sport-tuned suspension, 17" alloy wheels, limited slip differential, AC outlet on the bed, fog lights, hitch, oil cooler, battery upgrade, power locks, doors, and mirrors, remote, cruise, and other options and features. Our test car also had a $200 stereo upgrade, $120 bed mat (a very good investment), and $370 running boards, which some may find useful and others can do without. The base price of the 4x4 Access Cab with V6 is a reasonable $22,245, but our model ended up at a somewhat less impressive $28,038. Even without any options, the Access Cab 4x4 has four wheel antilock brakes with electronic distribution, a front passenger airbag cutoff, air conditioning, six-speaker CD player, tilt/telescoping steering wheel, and engine immobilizing. A base model Tacoma, with standard two-passenger, two-door cab, four-cylinder engine producing as much power as a V6 would a few years back (164 hp) is around $14,000, which is quite reasonable. The fours come with a five-speed stick or four-speed automatic, while the V6 is coupled to a six-speed stick or five-speed automatic (though we'd say it needs the extra gear less). While it's great to have acceleration on tap no matter what the engine speed is, theV6 is rather raucous, and we suspect in an American car, reviewers would be jumping over each other to call it "unrefined." It is, in short, loud. But it's also fast, with 0-60 sprints of under 8 seconds (Toyota claims 7.5 with the automatic and under 7 for an XRunner), and responsiveness right off idle even in higher gears. The first gear is fairly low, so the engine moves quickly and loudly up to redline; sixth gear feels comfortable at a fairly low 45 mph, thanks to gobs of low-end torque, but the overall gear ratio is reasonable, with the engine running, according to our calculations, at a comfortable 2,600 rpm or so at 70 mph. At highway speeds, road and wind noise is evident, but not excessive. The stiff clutch pedal may annoy some people, and we would have preferred the long-throw six-speed shifter (four cylinders get five speeds) to have a guard against going into reverse, like the Volkswagen "left up and push" system. Fortunately, the Tacoma beeps while in reverse gear, a handy alert to know when you've gone just a little past first and are set to go in the wrong direction. The 4x4 system, available on all engines, is controlled by a simple rotary knob that's easy to turn, with high two and four wheel drive and low four wheel drive. Stability control is optional. Getting into the Access Cab is fairly easy for both front and rear passengers; while the floor is fairly high, it isn't excessive, and the seats are low. The front doors must be opened to get access to the rear doors, but once those are open, the entire side of the cab is exposed. (As with all such designs, sometimes a little planning or maneuvering is required when getting front and rear passengers out in a parking lot when another car is parked alongside). This setup seemed a little easier than most, and to make it even easier, you can still fold and push the front seats forward, as though there were only two doors. However, once in, passengers will find the rear seats to be somewhat disappointing, with little padding and very little seat space. Some car seats are simply to large to be used in the back, even with the LATCH system (fortunately, the front passenger seat has LATCH and the passenger side airbag can easily be shut off). While the rear seats are somewhat small, there is actually space for sitting, and with the seats folded up, fairly large amounts of cargo can be stored inside the cab, away from the elements. Generally, the Access Cab should be considered a convenience for carrying stuff, with the potential to carry people for short distances in a pinch. Children may enjoy the back seats, too. The larger Double Cab version has four full sized doors and a three-place rear bench seat, which can hold five passengers; to compensate for the extra cab length, you can get a five foot bed (or the standard six foot bed that's available on the other Tacomas). The interior is an interesting styling exercise. The instrument panel uses one large circle and two part-circles. deeply set back to avoid sun glare. The backlighting, which goes on as soon as the car is started whether the headlights are on or not, is an orange-amber which helps to preserve night vision; it's consistent across the interior, except for the red gauge needles. 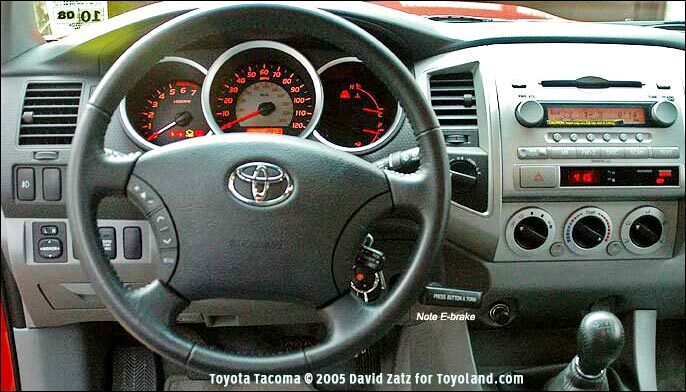 The center pod has the 120 mph speedometer, the left a tachometer, and the right temperature and gas level. Various option buttons are scattered across the dashboard; our truck didn't have enough options for us to tell if the layout was logical. The retro emergency brake seemed like an affectation - it's the pull kind, but you have to press and twist to release it - we thought the last one of these had gone away long ago. It just didn't seem to mesh well with the modern tilt-telescope steering wheel (which works by friction, so it's got a continuous range). The headlights are unusually well focused and bright, a Toyota trademark. While the optional CD-changer stereo in our Tacoma was surprisingly good, not just in sound quality and stereo separation but also in voice (the bass can be turned all the way down), it is an integral system and replacing it with an aftermarket unit would require serious work to the center stack. Our main gripe with the system has nothing to do with the excellent sound, but with how you adjust it: the tuning knob doubles as an audio button/knob, and there's surprisingly little resistance on the knob, so that when you press it to get bass, treble, balance, and fade controls, it's far too easy to change the radio station at the same time. Beneath the stereo is an LCD clock and the airbag status indicator, and beneath that the simple, understandable three-dial climate control (with separate buttons for turning on the air conditioner or recirculating the air). The entire center stack is done in a patterned silvery plastic with metal-colored knobs, buttons, or, in the case of the climate control, knob indicators with black knobs. The rest of the interior on our test truck was a light or dark beige or black. There are many styling elements in every part of the truck; it's not nearly as dull as, say, a full-sized Chevy truck or a Chrysler 300. There's always some detail to see. Storage abounds, with a generously sized center console, good-sized glove compartment, overhead sunglass holder, three front cupholders (that can be used for other items), cupholders molded into the door map pockets, and even map pockets in the backs of the front seats, for the rear passengers. There's also a convenient pickup bed behind the cab, of course - on our truck, protected by a convenient rubber mat. The pickup door is much lighter than those on most American models, and is easy to swing down and latch back up. Just inside the truck is the optional AC outlet (which can be shut off or turned on from inside the cab), providing a convenient 400 watts of 120-volt current. With the TRD setup, cornering is, not surprisingly, very good. Bumps are definitely felt, but everything is cushioned, as one would expect from a Toyota; washboard and other nasty surfaces are still very definitely felt. The ride is on the firm side of comfortable, but it is still fairly comfortable. Acceleration is, as mentioned before, instant and quick. There's little body lean and cornering is confident and capable, but the massive hood with its huge hood scoop (almost certainly for show rather than go) doesn't help the Tacoma to feel sporty, and hard braking almost invariably resulted in squeals or wheel hop. One of the interesting things about the auto industry is watching the trends. For years, the Dodge Dakota remained the only mid-sized truck, and it wasn't especially popular - particularly when compared with the GM and Ford full sized and compact pickups. The new Chevy Colorado and the most recent redesign of the Tacoma both return to the "old pickup feel" (along with the Nissan pickup), with clear mechanical feeling in the manual transmission, roaring engines, and lots of torque in the low revs, and both are larger than the compact trucks as defined by the S-10, Ranger, and Hi-Lux. Of course, automatic-transmission Tacomas without the TRD package, or with the four-cylinder, will have a very different feel from our truck. Toyota's specialty, comfortable ride, is no doubt much more in evidence in the non-sport-tuned trucks, while cornering won't be as good; but it will almost certainly be good enough for most buyers. Gas mileage with the four-cylinder is better, and acceleration is still pretty good. The automatic takes off quite a bit of the Tacoma's edge, without hurting gas mileage, while the manual preserves the maximum torque-truck feeling and gives better acceleration in the bargain. Some traditional big-three pickup buyers may be leery of moving to Toyota, even after, say, a bad experience with a Ford. But Toyota's been the standard of pickups and off-road vehicles in many other countries for years; their traditional quality and reliability are in their trucks, too. These are not "can't-take-a-beating vehicles. Chevy and Ford buyers will almost certainly find them to be tough enough, despite a gaudy-in-spots interior. The Toyota Tacoma is different enough that we suggest you include it in your car shopping, though if you want something quieter and more comfortable, albeit not as fast, the Dodge Dakota may fit the bill more. 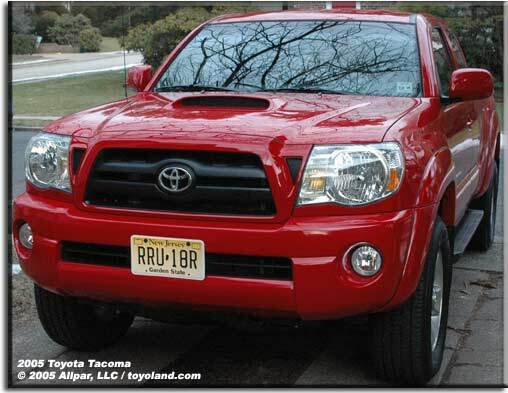 As for the Tacoma, if you just want a vehicle to carry stuff from point A to point B, or if you want more comfort, look at the four-cylinder; if you want speed and sportiness, the TRD package with the V6 (perhaps the XRunner); and if you're in the middle, the automatic V6 (sans TRD) may be nice.